Growing up, I was often lonely. My family moved every few years, and I was always the new girl in school, on the outside looking in, hoping to find a way to connect. When I was 8, we moved to a suburb of Cleveland, Ohio. There was a public swimming pool in our new neighborhood and although it was distinctly unlovely, concrete-y and surrounded by a chain-link fence, I loved it right away. I didn’t have to struggle to fit in there, somehow the moment I arrived, I was immediately a part of things. The pool became my new best friend. I spent nearly every day of the summer there, flying off the diving boards (high and low) and swimming lap after lap in my own summer swim-a-thon. I can’t remember how I even got there – did my mother drive me? The pool was quite a distance from our house. And if she drove me, why didn’t she stay? I have no idea. But I was never lonely there. Never. One morning, I dove into the shallow end and swam to the bottom of the pool. The light was hitting the water at an angle and I swam into the line of it, so I could feel where the sun was making things warm. I skimmed just above the tile floor feeling the ease of my movement and the light above and all around me. It was just me and the light and the water. And then it happened. Whatever it was, this something/nothingness was everything I needed. It was a feeling of peace so profound that I can feel it even now, as I write this, decades later. I’ve learned that what I had is referred to as a “peak experience” by psychologists – a transcendent moment of pure joy. And the experience was so powerful, so unforgettable that it set me up for life with one of my most valued primary relationships: myself and water. In particular, myself and swimming pools. You might be sniffing at this, at the idea that someone could love a big bucket of chlorine so much. Perhaps you are thinking that fresh water or, better yet, ocean water is what should be enshrined in my heart. I would answer that the heart loves what it loves and wants what it wants. And the moment in that Cleveland pool was so powerful, it sparked a love in me which has lasted a lifetime. 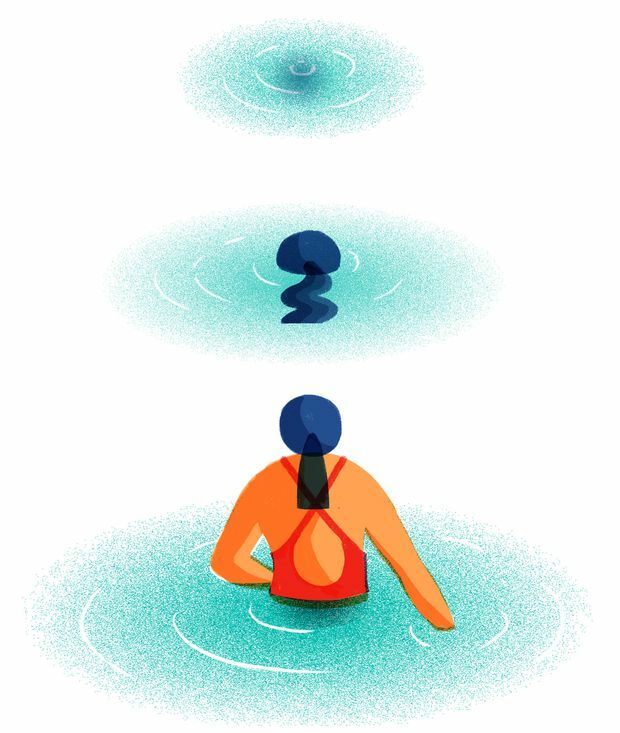 I get in the pool to celebrate when I am happy, to soothe myself when I feel low and to be left alone when I want to sulk. The water, bless it, never tells me to snap out of it. Everywhere I go, I look for a pool. When travelling, I always make sure to find one and that has led to some incredible adventures. Once in the Orkney Islands, off the north coast of Scotland, I learned that the only public pool was attached to the local middle school. I found my way there, took an ecstatic dip and then revelled in being able to eavesdrop on the families who were swimming nearby. I heard a young mother telling a friend the story of waking up the previous morning to discover a sheep standing in the middle of her kitchen. Her toddler had woken early and was trying to persuade the sheep to try a bit of crunchy breakfast cereal. The mother decided that since both the sheep and the child looked content, she would simply stand by and let them do their thing. I can still see the mother and her friend, standing waist-deep in the water, hands on hips, their heads thrown back in laughter. I would never have had access to these people or their great conversation had I not gone to the pool. In Budapest, my son and I navigated the cracked concrete, post-Stalinesque aura and freezing cold temperatures to dip into a craggy public pool. Amidst our shivers, we were dazzled by the grannies there, who, no matter what state of fit or flab they might be in, always wore bikinis. And sorry, Mozart, but in Salzburg, my favourite thing about the city was not your birthplace nor the delicious apple strudel, but the public pool I found tucked away on a leafy corner. That pool had a gorgeous painted mural on one wall and an outdoor area for sunning. Now that summer is here, I will have many chances to swim in the pool out front of my dad’s apartment building, smack dab in the middle of Toronto. It is hard to imagine how tucked away a place could feel in the bustle of such a big city. But this pool is shrouded with trees, gets just enough sun and is always surrounded by happy, grateful people. Not being a Torontonian, I never know anyone but I can always talk to the people there, partly because Torontonians tend to be friendly and partly because the water connects me to myself and then it is a breeze to make a connection to someone else. I’ll dive deep again and skim along the pool bottom in the sunlight, not waiting or hoping for anything to happen or not happen. Just being there, with the water, my lifelong friend. Lorne Holden lives in Stockbridge, Mass.